It seems to feed off of a magazine. If only I had £385 plus an extra £60 for mags. how well did they perform? I was ever going to do a WWII US loadout I would have to consider this! I'm waiting to hear about G&G's offering. Allegedly they've designed a top loading mechanism to give it a bit more realism, which will likely make it more expensive and harder to get parts for to upgrade, as it'll have to have a unique g'box and hop unit, I imagine. But it's bound to be awesome if the rumour is true. The way they had it wrapped up at SHOT this year didn't fill me with confidence. I mean it could be they've just come up with something so amazing it had to be hidden away, but to me it was screaming that they've either not come up with a design yet or the one they have come up with is terrible. 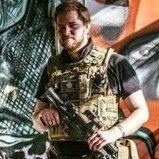 The last bit of news about it prior to the show this year said it was about a 20 round mag capacity which for me would be too far on the low side for an AEG. They'll have to go some to beat the ICS I think, but I won't be buying either until they're both out and well covered reviews wise.